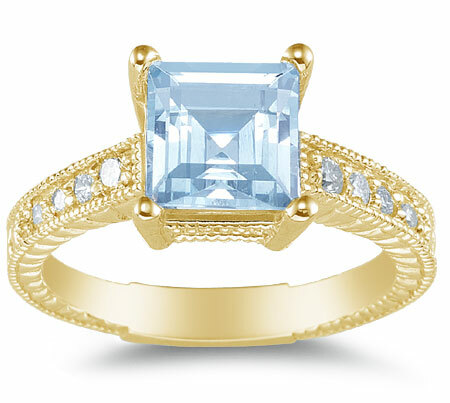 This 2 carat princess-cut authentic aquamarine and diamond ring in14K yellow gold from Apples of Gold Jewelry combines the frost-like blue of an aquamarine gemstone and the sparkle of diamonds to create a unique ring. Eight H-I color and SI clarity rated diamonds sit nestled into the band of the ring and total 0.18 carats. The 7mm x 7mm princess-cut icy blue aquamarine gemstone is A rated and adds character to the intricately designed yellow gold ring. We guarantee our 2 Carat Princess-Cut Aquamarine and Diamond Ring, 14K Yellow Gold to be high quality, authentic jewelry, as described above.